Keeping your home drains healthy is very low on most peoples list of ‘to-do’s’. Most homeowners are like firefighters, they put out home maintenance fires as they become really urgent. Things like a broken hot water system, leaking roof, or a tripping safety switch receive immediate attention and often involve significant emergency funds. All these issues, if managed proactively with ongoing maintenance, could be avoided and the costs involved reduced by a long way. Your homes’ plumbing systems fall into this category too. They’re often forgotten about until a ‘home maintenance fire’ occurs, such as a blocked drain, backed up toilet, or a flooding stormwater drain. The enormous fatberg recently discovered in Sidmouth, a town in the south of England, is proof that not keeping an eye on your drains can leave you in a very smelly, sticky, costly and unfortunate situation. The colossal mass of fat, oil, grease, wet wipes, and so many other foul items measuring around 64 metres long is clogging up a large sewer drain in the small seaside town. It’s estimated that clearing the fatberg will take crews in breathing gear using water jetters, shovels and pickaxes up to eight weeks. 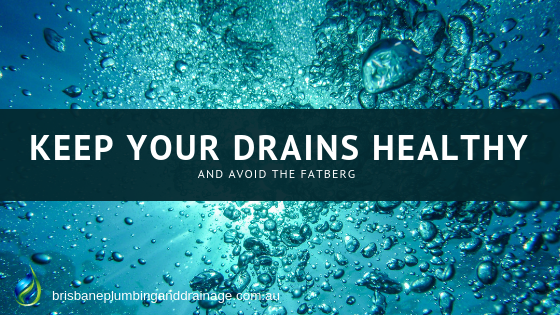 Home drainage systems are just as susceptible to fatbergs. In fact, due to the smaller size domestic drains can block up faster and more often than mains sewers. Carrying out regular plumbing inspections and drain cleaning, yearly is recommended, can prevent fatbergs in your home sewer system. Another way to prevent blocked drain is to keep your plumbing healthy by only using it for what it is designed for - efficiently removing grey water (water from the sink, shower, bath, and laundry) and black water (from the toilet) from your home. What it’s not designed for is to be a rubbish bin. You can’t dispose of all manner of household rubbish down your sink or toilet and expect it to just wash away. Most of it will end up blocking your drains causing your very own fatberg. What not to dispose of down the drain? Wet wipes - no not they are NOT ‘flushable’, regardless of what the packet says. This includes - toilet wipes, baby wipes, bathroom/kitchen/BBQ/cooktop cleaning wipes, those little hand wipes they give you in fast food restaurants, etc. Keeping these items out of your drains will help to ensure your drains remain free of the dreaded fatberg. If you’re having issues with the drains of your Brisbane home give out team a call we’ll find the blockage and clear it quickly.